Product Reviews — PJKoenig Golf Photography PJKoenig Golf Photography - Golf Photos For Those Who Love The Game. Late one evening, I received a text message from my friend, AJ Voelpel. That text read, “Art!! I am going to make fu$king art! !” I am not sure how many cocktails AJ had consumed but it was clear that he was passionate about his project. Only months later, Good Boy Originals (GBO) would burst onto the scene with some of the coolest and cleanest golf art in the industry. You only need to take one look at GBO’s inspiration page to understand what AJ was so fired up about that evening. AJ takes matchbooks, tees, pencils, ball markers and divot tools, from some of the world’s most notorious golf clubs and poses them luridly. He calls his work limited object art and It is seriously cool. Warning: Do not play with matches at home. AJ is a professional match book handler. As an avid collector of golf objects myself, I have struggled with the best ways to display my collections. Good Boy Originals has this figured out in a beautiful manner. I recently acquired my very own 11x14 Golf Dreams piece and immediately became one of my favorite things on my wall. The good news is that if you can’t find something that inspires you, Good Boy Originals will work with you to create that custom piece that will set your wall on fire. Do you love filming your golf swing? Do you have no friends? If you answered yes to one of the above questions, it may be time to look into SelfieGOLF. The company originally came into existence when it addressed the difficulty solo golfers were having filming their swings. They developed the first-ever cell phone clip system that gives golfers immediate feedback on their golf swing. The picture below pretty much describes it. It's easy to use and saves you from bugging your friends (or lack of) to film the action. That ponytail alone is worth documenting. However, the purpose of this post isn't to provide a review of the clip or poke fun at your lack of friends. What caught my attention was the company's newest design, the SelfieSPINNER. As a man with hundreds of divot tools and ball marks, I know my golf course tools and this one is something unique. The tool combines 7 popular gadgets into one sleek design. My favorite is #7, the fidget spinner. If you don't know what a fidget spinner is, you need to get with it. SelfieGOLF needs your help to get this Spinner party started. The Kickstarter campaign ends on December 13th and they are looking for more backers. Head on over to the campaign to learn more and pre order yours today. You will literally be one of the first people to own it. Fidget Spinner - Could this be the calming effect your declining putting game needs? A while back I did a review for a company called Tee Box Club. It's a website where you can sign up for a monthly subscription of golf balls delivered directly to your door. As it turns out, Tee Box Club will be joined by another competitor in the space. A company called Revolutionary Golf Balls is looking to offer a similar service, with a custom differentiator. That custom differentiator is actually customization. If you are anything like the average golfer, chances are you have not been properly fit for golf equipment. It is even more likely that you have not been custom fit for the type of golf ball that you are using. This is were Revolutionary Golf Balls comes in. Users will be prompted to fill out an online profile where they can store all of their swing statistics and information. Things like swing speed, weight, gender, and handicap will be used to determine the perfect fit for each individual golfer. If you have a golf ball preference, or already know exactly what you are looking for, an option for that exists as well. After that, your golf balls will show up at your day every month. and away you go. All of the golf balls you receive each month will be brand new and not refurbished. The service also plans to offer the golf balls at a reduced cost compared to the competition. If you are interested in learning more about this upcoming service, you can visit RevolutionaryGolfBalls.com. The company is planning to launch a Kickstarter campaign in March 2018. When Sebastian over at Storelli reached out looking to talk insoles, I wasn't necessarily stoked. But if you think about it for a second, insoles matter. So I figured why not, when you play as much golf as I do, you burn through insoles and shoes pretty quickly. Plus Sebastian is a golfer and I like golfers. You can get the basic idea of the Storelli Speed Grip from the picture below but this video does a great job of giving you the details. Great! So how in the hell is this going to allow me to play better golf? Does it even matter? That is exactly what I asked myself. So I decided to play some golf with the insoles and give you the details. Here is the quick 1.2.3. One of the most important aspects of the golf swing is feeling a firm connection to the earth and keeping that connection solid. Storelli Speed Grip insoles actually tape into place and do give you slightly better feel and stability in your stance. The insole only slightly effects 1 out of the 50 variables in the golf swing so it's not gonna change your life. Over the years, golfers have gotten tired of paying $48 for a dozen premium performing golf balls. Every time, a golfer popped one into the woods it was costing a stroke and $5.00. Acushnet, the company that owns the Titleist brand, had owned this space with their Pro V1 golf ball. For years, options remained limited, prices inched higher, and golfers grew frustrated. Most recently, golf ball manufacturers have realized that there is a huge opportunity to create a premium ball at a more affordable price. Companies like Vice, Oncore, and even Costco have moved into seize the opportunity With the Kirkland Signature ball making the biggest splash in the marketplace, others are still vying to move in on Titleist's reign. It's not happening just in the USA, In Germany, a company named WYRE Golf is making moves by selling it's golf balls online. Born from the desire to spend less on golf balls and more on beer. WYRE Golf has the purest of motivations behind it's efforts to bring you a high performance ball at a low price. Wyre Golf offers 3 different versions of golf balls designed to fit golfers with 3 different types of skill sets. Today we will be focusing on my experience with the Titan as this is the sort of ball that I prefer. I took the Titan golf ball out with me on my trip to New York to show it some good times while testing it out on some pretty amazing surfaces. Here is a quick breakdown of my findings. Off the tee, the golfball flies deep with a strong penetrating flight. The ball is forgiving on mishits with minimal sidespin. The feel and sound of the golf ball with my iron shots was not as crisp and soft as I was used to. Even though the control was certainly acceptable, this was true around the greens as well. The cast urethane cover is slightly different when compared to a TP5X or Pro V1 golf ball. The golf ball performs well after finding the green and bites nicely. The Titan has a nice aiming line for putting. The WYRE Titan golfball is certainly a high performing golf ball. It just fits into a tier slightly below it's high performing counterparts. The best news about the Titan is that it is priced well below the cost of the golf balls that it is competing with. Coming in at 21 Euro or roughly $25, your performance to spend ratio is dramatically rising. The bad news for American golfers is that WYRE is currently based in Germany and operating only out of The Middle East and Europe. This means that these golf balls are not available in the USA. Once the company raises enough capital to WYRE America, the mission will remain the same, to provide high performance golf balls at incredibly low prices. European or UAE followers please use the promotional code "wyrekoenig" to receive a 15% discount on your first purchase. The story behind the Lunatic Fringe Brand clothing company is an interesting one. The founder of the company is a young entrepreneur named Matt Matchett and his company is not an original idea, but a family one. Back in grad school, Matt's father created the angry golfer logo and started selling shirts and polos to local stores. In 2017, Matt picked up where his father left off. Right now, the company is only selling polos, so that's what we are digging into today. To me, the angry golfer logo is what really makes the polo pop. Everyone understands what a maddening game golf can be and the logo encapsulates and expresses that raw emotion. While you don't have to act like a maniac and smash clubs all over the course, you can just let your polo do the work for you. I have modeled some of the finest polos in some of the finest locations. Even in this poorly lit pose, The Lunatic Fringe Chambers Bay modeling session was no exception. Book me today. Right now, the polo is only available in 100% cotton. I would really like to see a polyester blend provide a more athletic option for some of the warmer days on the course. The cotton option is nice but can get hot quickly. You can view the current offerings here on their website. A logo is a great start to building a brand, but the company has done very little to capitalize on a solid foundation. I am excited to see how things develop and expand with Lunatic Fringe Brand. Recover Brands is an apparel company that uses 100% recycled materials to create it's products. Their mission is to create the best, most environmentally friendly and socially responsible products possible; and to educate and inspire those around them to live and work for a sustainable tomorrow. My golf polo model game remains strong. Hit the contact button below to book me for a shoot today. Since 2010, Recover Brands has diverted 5.4 million plastic bottles from the landfill. Holy crap, that is a serious amount of bottles. But get this!... America actually disposes of 5.4 million bottles every hour. The good news: Recover Brands has tapped into an economically vast and environmentally helpful source for its products. The actual process of how Recover turns 8 bottles into 1 shirt is quite interesting. But in short, they shred those bottles into flakes, melt the flakes into pellets, turn those pellets into yarn, and then sew the shirts. When I first heard of the company, I thought the idea sounded interesting, but I remained skeptical on the quality. I feel like the majority of people perceive that anything that is made from 100% recycled products must somehow be inferior to something made by a large name apparel brand. After receiving the polo in the mail, I realized that I was mistaken immediately. The shirt fit great and has a simple classic style. It feels similar to other polyester blend shirts and you would never guess that it is made out of plastic bottles. The cost of the shirt is $39.00. For a guy with an entire closet full of golf polos, it says something that this shirt made it into the regular rotation right away. Now, I am well aware that big brand apparel deals with PGA players have typically shaped the landscape of what people are wearing on the golf course. But perhaps, it is worth taking a second to consider an alternative. If name brand isn't a requirement and you are looking for a good quality shirt at a reasonable price, Recover is one of the easiest environmentally sound decisions you can make. You gotta do something to offset the environmental impact of spraying a dozen Titleists into the woods every Sunday. Recover also makes more than just polos, the company also has hoodies, shirts, and accessories available on their website. Learn more about Recover Brands and the great work they are doing here. When it comes to training aids, I am always skeptical. With so many out there, it is difficult to sort through those that are worth while and those that are a waste of time. To give some background. Here are the criteria in which I measure the validity of training aids. Repetition and muscle memory are the only ways to actually make a change to your swing. When making changes in your swing, the movement must feel exaggerated at first. Visual cues are very helpful when training. Two swing thoughts are one too many. Positive swing changes take real time and effort. When you head to the Gsix Products website, you will find the compelling story of a family business started by a man named Dave Grill. This family owned company is the business that brings you the Delta Putt. Dave is a man who is passionate about the product that he created. Not only is Dave the creator, but he is also a big time believer and user of his own product, which is always questionable with other products in the marketplace. The goal is to line up the putter and hit the triangle right down the middle of the track. Each side of the triangle offers a different difficult level (amateur, pro, and tour). The device will give you immediate feedback as it veers off to the right or left dramatically with a slight mishit. The tour level is actually quite difficult. The idea is that you will immediately learn patterns in your putting stroke and then be able adjust your setup and stroke according to that feedback. The idea is straight forward and simple. Dave does a good job of explaining the feedback in the video. It is tough to stay interested. It primarily focuses on line not speed. Although, I do have an aversion to practicing putting for more than 15 minutes, it's tough to stay interested when there is no pay off or game-ification associated with the device. I am the sort of golfer that needs a fun putting drill or contest to stick around. You will have to come up with your own ideas here. However, if you are the sort of player that loves a good distraction in the office, this can be a great way to groove that putting stroke in between conference calls. The most powerful impact that the Delta Putt can deliver comes from the feedback it provides. As compared to rolling a golf ball, The Delta putt will show you even the slightest push or pull. A short putt with a golf ball might go right into the hole and you would think everything is on track. However, that same stroke with The Delta Putt might reveal that even thought the ball was struck well enough to find the hole, the putter face was slightly open. This valuable insight can help you manage your game at the detailed level required to consistently putt down the line. Are you tired of blending in with the local golf crowd? Perhaps you are looking for an edge that will set you apart from the traditional golfer? If this sounds like you, then perhaps Bad Birdie Golf is your sort of company. Bad Birdie makes golf polos for players whose style is as fresh as their game. Here I am wearing the Salty Savage. When was the last time you received 4 compliments on your golf polo in one round? There are a variety of impressive styles offered on BadBirdiegolf.com. It's worth heading over to their site just to read the shirt descriptions. You will find things like, "We attached a golf polo to a giant electromagnetic metal rod on top of a skyscraper during an intense lightning storm. A lightning bolt struck the polo and left this design." Each polo is hand sewn with moisture-wicking and anti-odor fabric that’s 100% polyester and 100% made in the USA. If you have spent some time around the game, you have seen the golfer that shows up to the course wearing loud pants paired with an aggressive polo. Or maybe you saw Billy Horschel wearing octopus pants Sunday at the 2013 US Open. Perhaps you saw a picture of John Daly... just any picture of John Daly. Clearly, there is something happening here. There must be some sort of power in the apparel. A player can actually benefit greatly from looking good on the golf course. A golfer that dresses boldly and with confidence is more likely to play in a bold and confident manner. A golfer that doesn't care about other people's opinions is also more likely to play within himself. With this same type of approach, Tiger Woods used his "Sunday Red" to win 79 times on the PGA tour. With golf being such a mental battle, why not turn in that tired old polo for a new confident approach? Bad Birdie might not be the company for you and it certainly isn't the company for everybody. However, one cannot deny that there is power in the polo. The question is, are bad enough to harness it? One of the best things about being involved in the golf business is the amount of passionate people you get to meet and work with. 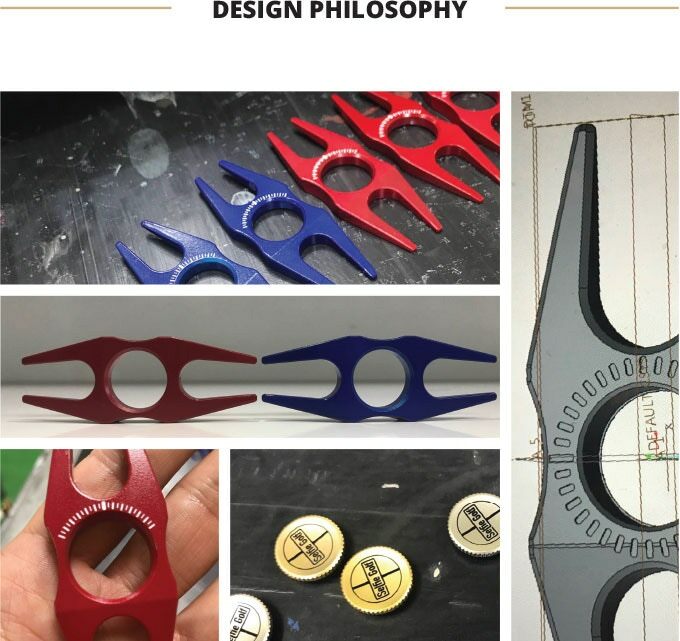 When Shane over at Clutch Putters reached out to me with a request to review his product, I could tell immediately that this was a putter company that started with a passion. Shane, the Founder of Clutch Putters, has been a golfer since he was 10 years old and used to run a downhill skateboarding company called Incline Longboards. After selling that company in 2014, he decided to leverage his love for golf with his shaping and milling experience to create Clutch Putters. Clutch works with local manufacturers in the Ann Arbor, MI area and every putter is created 100% in the USA. Their philosophy is a simple one: "To create a high quality putter for the everyday golfer who wants to score better." The first thing I noticed about the putter is the 7 adjustable weight slots that give it a similar look to the PXG style from above. The V shaped flange of the putter also give it a subtle but obvious alignment aid. The second thing I noticed about the putter was that there are are no grooves on the face of the putter. The idea is that by moving the center of gravity towards the top of the putter, a larger sweet spot with more forward roll will be created. Overall, Clutch Putters has certainly succeeded in their mission to create a quality putter. If you can get past the notion that only a large or well known manufacturer of putters can deliver a quality product, this might be an option worth exploring. If the shape fits your eye, then you my friend, are in for some serious birdie bomb action. Clutch currently only has one offering in style and retails for $199. You can learn more and become a Clutch Putter yourself, here, on their website. After several rounds with Clutch, you will notice the larger sweet spot. The large size of the putter may be a turn off for some, but with the weight ranging from 319 to 361 grams, it is a very easy putter to handle (most putters weigh about 350 grams). With an adjustable weight system, you can adjust your Clutch putter to match the speed of the greens you are playing. The conventional wisdom is that a heavier putter works to slow down your stroke on faster greens. Clutch could use an upgrade to their head covers as the putter ships with a rather plain neoprene and velcro cover. However, a solution could easily be found at your local pro shop and Clutch is working on an upgrade. When it comes to following your favorite sports and athletes, one of the biggest challenges is staying on top of things when you have so many other responsibilities in your life. That being said, it’s often inconvenient or difficult to be next to a television or radio, which means that you will sometimes miss out on a few important matches. But, what if that was a problem of the past? Well, with CBS Sports game streaming, you no longer have to miss out on the action, regardless of where you are or the time of year. For most sports apps scores and highlights are made available after the game is finished, which doesn’t help if you like to see how everything transpired. With CBS Sports, however, you can tune in to practically any game going on, so you never have to wait until after the game is finished to catch up. All you need is your mobile device and a strong connection, and you’ll get to see it all. Although watching the match in real time is the best way to experience it, sometimes, you just can't devote all of your attention to your most desired matches. So when that happens, you can still at least get the score as it changes throughout the game, allowing you to still be on top of the action, even if you aren’t seeing it unfold. What makes the free sports news app download the best streaming tool available is the ability to be notified whenever something happens related to your favorite athlete or team. You choose how many teams, sports, or athletes you want to follow, and all of the information comes to you directly to your mobile device, rather than having to scrounge around for it. Whether it’s news, game updates, or the latest scores, this app shows it all. Over the past several decades, the golf industry has seen a dramatic and increased focus on fitness and health. Here to join the party is Par Bar. With no other nutrition bars designed specifically for golfers, Par Bar is in a great spot. Developed by a Food Scientist who recognized the lack of options for golfers, Par Bar aims to improve mental alertness while tasting delicious. Not only is the bar par check off a lot of boxes on the essential ingredients list, it also tastes awesome and has some of the coolest packaging I have seen. Par Bar is an excellent option to the hot dog at the turn that you are usually getting. That Snickers Bar on the back nine may taste delicious but is it helping you shoot 72 or 82? While it is not the only deciding factor on great play, eating with a purpose to play great is a smart choice. While it is not the only option when it comes to eating for performance, I would recommend checking out their site and giving them a shot. One of the most fantastic things about 2016 was that ridiculously good 7 iron that you snuck through the gap in the trees that ended up 2 feet for birdie. But if you are like most golfers, you will spend most of 2017 chasing that same shot, and will not find it near enough. The folks in the business of golf are keenly aware of this endless pursuit and have designed a wide variety of training aids and products to capitalize on the opportunity. The trick for golfers is to differentiate between which products will actually help you hit more of those great shots and those that are just gimmicks. As with most golf products, I was skeptical when I first heard about the Golf Slot Machine, but I was happy to give it a fair shot. To give some background, here are the premises that I subscribe to when evaluating a new training product. Lay the Golf Slot Machine down on the ground when practicing. Follow the colors and cues to visualize the path of the club head. Repeat the exaggerated motion for 15 minutes before taking away the aid and swinging normally. As you can see, the Golf Slot Machine keys in on my basic criteria, but does it actually work? The Golf Slot Machine does fall into the category of those golf products that can actually help. Golfers that often suffer from an over the top type motion will find this product most helpful. This is not to be taken lightly as going from a weak fade to a strong draw can actually change your life. Even low handicappers can use the device to grove their swing paths. Personally, I found the movement to substantially help with my driver and longer irons. The more I used the Golf Slot Machine and got comfortable with the movement, the more I was able to trust my swing. As I often suffer from an irritating power fade, I found myself hitting more consistent powerful drives over time. By moving the club head on an inside to out path, most golfers can more consistently hit these powerful, well struck golf shots. The Golf Slot Machine is certainly not a magic fix to the golf swing but it does give you great visual cues and a game plan on how to generate a proper swing path that drops the golf club into "the slot." If you want the results, you will have to put in the time and effort but the Golf Slot Machine can help. Learn more here. When it comes to golf balls, I usually have a sleeve that I paid $10.50 for in the pro shop, and then I have a handful of "other" golf balls, which is a mix of what I found in the woods while searching for my drive. The result of this strategy has allowed me to hit just about every golf ball on the market. As a 2 handicap, I am still drawn to the higher end golf balls that can deliver a consistent feel around the green but also give me some distance off of the tee. Here are a couple of my thoughts on golf balls to warm you up to my experience. As a youngster, I owned and operated my own golf ball business that involved retrieving used golf balls from the creeks of the local par 3 golf course. At one point, I think I managed an inventory of around 2000 golf balls. I am old enough to remember the balata golf ball that delivered about 2-3 swings worth of durability. I think golf balls cost too much. If a golf ball can't last 9 holes without looking like it got into a fight with Mike Tyson (1987), I won't play that golf ball. My golf ball should not feel like a rock when I hit it. If I hit a crisp golf shot, that ball should check on the green and not bounce over the back. When the folks over at OnCore Golf came to me and explained that they had engineered a new golf ball that they believe will change the game, I was certainly willing to listen. OnCore has developed the only ball employing a hollow metal core that is still deemed 'conforming' by the USGA. That's great and all, but does this actually mean anything for my game? I don't care if the golf ball is filled with jelly beans if it can go long and land soft. Oncore makes an Avant and Caliber line for varying swing speeds and abilities. I took the Avant ball out for a tour and over 6 rounds here is what I found. The feel around the greens is pretty much the same as I was used to with higher end tour golf balls. Distance wise, I noticed a slight edge, however this is tough to really calculate, as I am certainly not a swing robot. Durability was excellent. After 13 or 14 holes, the ball appears relatively new and only displays slight scuff marks from long bunker shots. Probably the biggest difference was with the borderline shots. With the technology producing lower spin off of the tee, I noticed I was able to 'get away' with a couple of off line shots. OnCore's robotic testing has produced approximately 10% tighter shot dispersion. One can easily conclude that OnCore Golf has developed a premium golf ball. The big difference here is that you can purchase these golf balls for $20 a dozen. That's right, one dozen premium golf balls for $20. There certainly is a demand for premium golf balls at a reasonable price and OnCore is looking to capitalize. Get in on the golf ball party here. I am always on the lookout for cool golf towels. I like to keep a good rotation on the bag to keep things fresh. So when I heard about a Uther Golf (pronounced 'other'), I figured I would give them a shot. In order to really try these towels out and put them through the ringer, I headed out for some winter time golf in the Seattle area. After 6 or so rounds in the mud and dirt, here are my findings. The microfiber fabric is indeed extremely absorbent. The waffling texture does a great job at getting in the grooves after you chunked your pitch shot into the water. The towel loop with the carabiner is convenient and well made. At 15" x 24" I found the towel to be sufficient but not as large as I would have liked. The towel designs are fantastic. Responding "Flamingos" when asked "What's that on your golf towel?" makes you look and sound pretty cool. There could be more designs available as right now there are only 3 options on the site. Durability: After 6 or so extremely muddy rounds and a couple of washes this towel looks as good as new. If you are looking for a stylish high performance golf towel, you can't go wrong with Uther Golf. Please check out the full line up of products here. When Stanford student Brian Spaly couldn't find a pair of pants that fit correctly, he decided to build his own company and call it Bonobos. Shortly after, he would team up with his roommate, Andy Dunn, and create the largest clothing brand ever built on the web in the United States. in 2012, Bonobos expanded to physical locations and opened up "Guideshops." These are locations where you can try on clothes and find your perfect fit. Your order is then shipped to wherever you need them. A year later they would launch Maide, the golf brand of Bonobos. To me, Maide is all about great fitting clothes that look sharp and still offer a fun vibe to them. The festive polo you see below is easily one of my favorites in the closet right now. It also is my #1 compliment fetching polo in the current rotation. Based on my estimates, It averages 3.2 compliments per round. As evidenced in the video, the polos also help with eagle putts. Sean Ogle and I finish up an epic golf trip at Aronomink in PA. Sean has even declared the Maide golf pants to be the "Best in the world." Check out his review here.. The Blue Palms Minicheck could possibly dazzle your opponents into missing all putts within 6 feet. The Flatiron Half=Zip and the Highland Golf Pant deliver the one two punch. Maide apparel is available at www.maidegolf.com and offers a full lineup of polos, pants, shorts, sweaters, and t shirts. The brand is also available to try on in person at one of your local Bonobos "guideshops". To experience Maide Golf, you can set up your very own fitting appointment at www.bonobos.com/guideshop. State Apparel is not your typical golf pants and polo company. They have taken a unique approach to "reinventing golfwear" by transforming golf clothing into golf equipment. Now that you are thinking, "How the hell are pants gonna help me make that downhill 6 foot slider?" These pants won't make the 6 footers any easier but they can potentially make managing your round easier. State Apparel incorporates wiping layers into their golf pants and shirts. The idea is that by providing towel like fabrics on their clothing for wiping hands, clubs, and balls, golfers will never need to step away from a shot. I was skeptical when I first read this. "Will I really use these?" and "Won't my clothes get dirty?" "Oh look, here comes Koenig all covered in dirt, he uses his shirt as a golf towel." However, once I put on the clothes, I was actually surprised at how often I took advantage of the wiping layers, a scrub of the ball here, a wipe of the wedge there. Granted, the clothes are not for scrubbing the sod off your 60 degree after you chunked one into the water, but they definitely serve as a nice option for keeping things clean. The wiping layers on the polos are incorporated into the side panels on the shirt. From San Francisco to New York: The competition shirt was an obvious fit for a day of 36 at Winged Foot. The wiping layer on the Fairway Pants and Match Play Shorts resides in the pocket lining. It's pretty easy to access and I use it more than I thought I would. Another point of pride for State Apparel is that all of their clothing is actually made in San Francisco, California. With the majority of the clothing world utilizing overseas options, State Apparel has kept the business domestic. For those that make purchasing decisions after considering product origin, economic impact, and authenticity, State Apparel is a great option for the educated consumer. When Jay over at Thirty 6ix Golf Co reached out to tell me a little about their new golf brand, I was immediately interested. Their plan was simple, they wanted to create a brand that allows the golfer to showcase their love of golf while leaving the old traditions and stigmas behind. The company was started by a couple of guys that love to play the game and wanted to create a golf image of their own. Not finding a golf brand that they currently identified with, they started out on their own. The clothes are simple and to the point as well. Right now the brand features headwear, t-shirts, fleeces, and tank tops. My two favorite items are the post birdie tee shirt, and the hoodie. A rare gym selfie. I worked had to make sure nobody saw me take this photo. One of my favorite things about the apparel from Thirty 6ix golf is that it translates seamlessly to street clothes. You can let the folks know that you are serious about your golf even on those non-golfing days. Be sure to check out the full lineup of apparel over at 36 Golf Co's website. In even better news, you can use coupon code pjkoenig on your order to receive 10% off. I am a visor man myself, but I can recognize a hot snap back when I see one. You can rest assured that if someone 'gets' your t-shirt logo, you will be able to make some fast friends. For those not in the know, the 3 denotes the birdie and the 6 denotes the follow up double bogie. If you have played golf for any decent amount of time, you have certainly experienced these 2 numbers side by side on your score card. A solid logo like this makes for a great shirt and a great conversation starter. As fall golf approaches, the quarter fleece from Thirty 6ix Golf is a solid option. Socks are socks right? Over the course of my sock wearing career, I have pretty much maintained this point of view. A few pairs of socks here and there have stood out. Eventually they either wear out or eventually go missing. The fine folks over at LIFT23 are one of these sock brands that stick out. They cover my 3 basic tenants of sock evaluation criteria and cover them well. The folks over at LIFT23 also have a worthwhile mission outside of generating profit. Each sale of LIFT23 golf socks will result in both of the following. Next time you are looking for some golf socks, why not give back some socks as well. LIFT23 can help you accomplish that goal while delivering a mighty comfortable fit. Check out their full lineup here. Have you ever seen those hilarious commercials for Dollar Shave Club? The idea is pretty simple, make sure that guys do not run out of razors and never pay too much for them. Well, the fine folks over at Tee Box Club have decided to take a similar approach to the golf course. If you are like most golfers, you have undoubtedly ran out of balls or tees and had to opt for the $3 tee bag and $42 Titleists in the pro shop. If this happens to you on a regular basis, Tee Box Club may be a good fit for you. I decided to give the service a shot and here was my experience. The box arrives promptly each month and included a dozen golf balls and 15 2 3/4" high quality wooden tees..
After receiving my initial shipment, I decided to put these Pro V1s into play right away at Chambers Bay. All of the balls were in excellent condition as if they had been hit into the woods on the 1st or 2nd hole of their existence. Some of the balls had logos, but other than that, not a scratch. As you might imagine, I noticed no difference in the playability from a brand new sleeve. Although it took me until the 18th hole to find my first Tee Box Club birdie, I blame the player and not the ball. Fortunately, Tee Box Club strives to put the focus back on the game by removing any thoughts you may have about the cost of pumping two out of bounds on the 1st tee. Overall, it is a simple concept for a golfer that plays somewhat consistently and predictably. Tee Box Club is an easy way to save money on the golf essentials. To sign up or learn more, you can find Tee Box Club here. The 14th hole at Chambers Bay was the perfect place to break in the box from Tee Box Club.